Late dumping symptoms are a consequence of a reactive hypoglycaemia one to three hours postprandially, which results from an exaggerated insulin and glucagon-like peptide-1 (GLP-1) release (1). The frequent recurrence of hypoglycaemia will lead to serious consequences. It is significant to ascertain the aetiology and give timely treatment apart from correcting the hypoglycaemic state. A 66-year old male was admitted to the respiratory department of our hospital with typical symptoms of choking sensation in the chest, cough and white sputum. On the fifth morning in hospital, he was found unconscious suddenly after breakfast, with perspiration, trembling hands and difficulty speaking. Blood glucose then was 1.4 mmol/L. Measurements such as glucose injection were taken. Blood glucose was 11.4 mmol/L thirty minutes later. Similar episodes occurred again before lunch the same day. After consultation with endocrinology, neurology and the digestive system department, accessory investigations were suggested to be completed. Computed tomography (CT) scans, magnetic resonance imaging (MRI) and magnetic resonance angiography (MRA) revealed brain atrophy and ischaemia in cerebral white matter without any other abnormal findings in the hypothalamus, pituitary, adrenal glands and pancreas. Plasma concentrations of cortisol at 8 am and 4 pm were within normal range, thus adrenocortical hypofunction was excluded. Insulinoma was also excluded by normal fasting insulin concentrations and the normal imaging of the pancreas. Two similar hypoglycaemic phenomena happened again within a week. The patient was then shifted to the endocrinology department; hypoglycaemia recurred during the movement. After several hypoglycaemic episodes within one week, the patient was in a state of delusion and debility. The patient's past history revealed a subtotal gastrectomy with Billroth II reconstruction for gastric lymphoma twelve years previously. From 2008, the patient suffered from paroxysmal syncope about three to four times each year. On many occasions, the family members would give sweets and syrup empirically without monitoring the blood glucose. In May 2010, the patient was found at home in a comatose state with urinary incontinence and taken to a local hospital for treatment. Blood glucose measured then was 1.4 mmol/L. For this specific case of postoperative hypoglycaemic coma after several years, a provocation test using 75 g glucose (Table) was performed; venous blood was collected at nine time points and tested for the levels of blood glucose, plasma insulin and c-peptide. In addition, barium meal examination of the gastrointestinal tract was conducted, showing that the contrast medium got through the anastomotic stoma quickly. With regard to treatment, dietary and lifestyle modifications were advised firstly, in particular, reduction of rapid absorbable carbohydrate intake. It is best to consume small amounts on each occasion by dividing the recommended daily energy into several portions, avoiding excessive insulin secretion in response to the large amounts of glucose for absorption after every meal (2). Besides, acarbose, an alpha-glucosidase inhibitor, was orally administered at a dose of 50 mg before each meal. In consideration of the common side effects of meteorism and borborygmi as a result of acarbose (3), a low dose of 50 mg was given and trimebutine maleate was administered meanwhile. With the above treatments for a week, an oral glucose tolerance test (Table) was again performed. There were no further episodes of coma after the regular administration of acarbose. 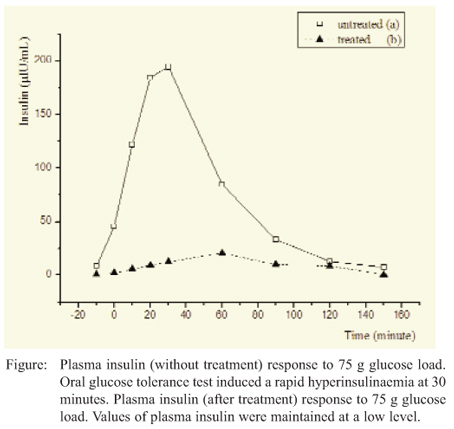 Compared with the results of the corresponding nine time points in two oral glucose tolerance tests, the treatments flattened and delayed the postprandial blood glucose and insulin peaks (Figure). The blood glucose fluttered around 4.3 mmol/L, with a difference of 1.94 mmol/L (the peak was 5.71 mmol/L at 60 minutes; the nadir was 3.77 mmol/L at 150 minutes). Similarly, hyperinsulinaemia was significantly attenuated. The diagnosis of dumping syndrome was made according to the following findings: (a) a history of subtotal gastrectomy with Billroth II reconstruction, (b) hypoglycaemia 120-180 minutes after glucose ingestion preceded by hyperglycaemia, (c) exclusion of insulinoma, (d) normal plasma concentrations of cortisol at 8 am and 4 pm, (e) ameliorated blood glucose and insulin level under treatments above. The mechanism of acarbose in glucose modulation is related with hormone level. Acarbose, as an alpha-glucosidase inhibitor, reversibly blocks alpha-glucosidase which is responsible for breaking down complex carbohydrates in the intestine into absorbable monosaccharides, leading to a reduction of postprandial hyperglycaemia as well as the release of insulin and GLP-1 (4). Although the hypoglycaemic effect of GLP-1 is glucose dependent, Toft-Nielsen et al (5) have shown that the exaggerated GLP-1 response to nutrients in patients with accelerated gastric emptying could be responsible for their high incidence of postprandial reactive hypoglycaemia. Some studies suggest that the glucose absorption by L cells is necessary for the release of GLP-1 observed after carbohydrate intake (6). It is likely that the alpha-glucosidase inhibition slows the digestion of the carbohydrates and strongly reduces the glucose absorption and the release of GLP-1 in subjects with gastrectomy. For this case, symptoms of late dumping syndrome without obvious relationship with meal happened frequently eight years after subtotal gastrectomy. Bilateral positive Babinski signs suggest chronic damage from hypoglycaemia to the cerebral cortex. Besides correcting coma, timely aetio-logical diagnosis and acarbose treatment will be necessary for patients in this case. Hypoglycaemia can be harmful to humans. Acute hypoglycaemia causes pronounced physiological responses as a consequence of autonomic activation, principally of the sympatho-adrenal system and haemo-dynamic changes. This may lead to dangerous consequences in the elderly with diabetes, many of whom have coronary heart disease (7). Some case reports indicated a relationship between severe hypoglycaemia, acute vascular events, and sudden death (8). Several large long-term trials, including the Action to Control Cardiovascular Risk in Diabetes (ACCORD) trial, Action in Diabetes and Vascular Disease: PreterAx and DiamicroN Controlled Evaluation (ADVANCE) trial, and the Veterans' Administration Diabetes Trial (VADT), showed a relative increased risk for overall and in particular cardiovascular disease death in the intensive arm related to severe hypoglycaemia (9). Furthermore, recurrent severe hypoglycaemia may occasionally cause sub-clinical cerebral injury or permanent cognitive impairment (8). With increasing bariatric surgeries, it is necessary for clinicians to recognize the complication of dumping syndrome and give timely and accurate treatments to prevent serious consequences resulting from hypoglycaemia. Acarbose, as a classic anti-diabetic drug, can improve hypoglycaemia due to late dumping syndrome by influencing the releasing of hormones such as GLP-1 and insulin. This work was supported by National Natural Science Foundation of China Grants 81170771, Science and Technology Development Programme of Shandong Grants jk027 and International Cooperation Programme of Jinan City Grants 201011008. The authors declare no conflict of interests. 1. Vecht J, Masclee AA, Lamers CB. The dumping syndrome. Current insights into pathophysiology, diagnosis and treatment. Scand J Gastroenterol 1997; 223: 21-7. 2. Tack J, Arts J, Caenepeel P, De Wulf D, Bisschops R. Pathophysiology, diagnosis and management of postoperative dumping syndrome. Nat Rev Gastroenterol Hepatol 2009; 6: 583-90. 3. Smith L, Smithers M, Prins J, O'Moore-Sullivan T. Acute and longterm effect of alpha-glucosidase inhibitor on dumping syndrome in a patient after a vagotomy and pyloric surgery. A N Z J Surg 2005; 75: 1124-6. 4. Imhof A, Schneemann M, Schaffner A, Brandle M. Reactive hypoglycaemia due to late dumping syndrome: successful treatment with acarbose. Swiss Med Wkly 2001; 131: 81-3. 5. Toft-Nielsen M, Madsbad S, Holst JJ. Exaggerated secretion of glucagon-like peptide-1 (GLP-1) could cause reactive hypoglycaemia. Diabetologia 1998; 41: 1180-6. 6. Nauck M, Vardarli I, Deacon C, Holst JJ, Meier JJ. Secretion of glucagon-like peptide-1 (GLP-1) in Type 2 diabetes: what is up, what is down? Diabetologia 2011; 54: 10-8. 7. Frier BM, Schernthaner G, Heller SR. Hypoglycaemia and cardiovascular risks. Diabetes Care 2011; 34 (Suppl 2): S132-7. 8. Wright RJ, Frier BM. Vascular disease and diabetes: is hypoglycaemia an aggravating factor? Diabetes Metab Res Rev 2008; 24: 353-63. 9. Schernthaner G. Diabetes and cardiovascular disease: Is intensive glucose control beneficial or deadly? Lessons from ACCORD, ADVANCE, VADT, UKPDS, PROactive, and NICE-SUGAR. Wien Med Wochenschr 2010; 160: 8-19.